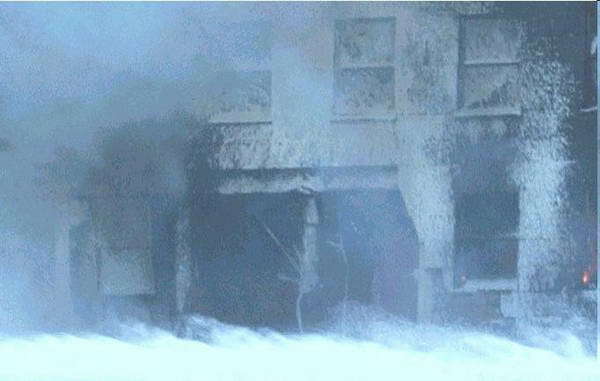 Is a collapse due to "structural failure caused by small office fires" likely to be perfectly symetrical, occur at nearly free-fall speed and turn the entire building into a dust cloud ? A group of over 1900 architects and engineers researched the video footage and the available evidence (debris and dust samples) and came to the conclusion that office fires could not have caused this form of a symetric collapse at free-fall speed. The fact that they found thermite - a special form of explosive used for the controlled demolition of buildings - in all dust samples they investigated raises serious questions. A scientific paper published by several of their researches as well as university professors describes their findings in detail. Another serious questions concerns the fact that BBC World television "accidentially" announced the collapse of WTC7 20 minutes before it actually happened (check out this footage from BBC World -This recording starts at 5:08pm and ends at 5:15pm - You can see WTC7 directly right of the correspondents head because the building did not collapse until 5 minutes later at 5:20pm). This leaves any rationally thinking person with a lot of unanswered questions. How could BBC World have known about the collapse in advance ? The explaination from BBC World is that they only picked up on a news report from Reuters and repeated that report on the air. There is no statement from Reuters on their "early reporting" on the collapse of WTC7. 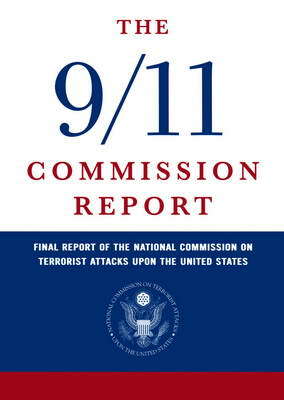 The most significant question probably remains : Why was the collapse of WTC7 not even mentioned in the 9/11 Commission Report, which until this day is the official writing of history. 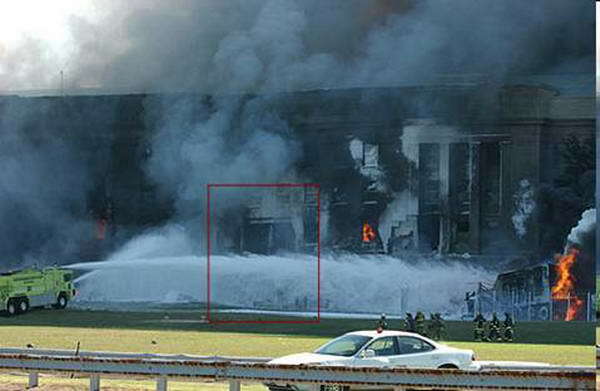 Several pictures were taken during the 30 minutes after an airplane allegedly hit the Pentagon and when parts of the wall of the Pentagon collapsed. These pictures only show a hole that is too small for a Boeing 757-200 to fit in. One would also expect two holes nearby where the two Rolls Royce RB-211 engines had to strike the Pentagon. It is also noticeable that almost no traces of any commercial airplane were ever found at the Pentagon, only some minor pieces which were carried away by hand showed up. Most of the airplane just vanished including its Rolls Royce RB-211 engines. For further information on this subject it is highly recommended to watch the documentary "National Security Alert" mentioned in the following bulletin point. Concerned US citizens founded the Citizens Investigation Team and started to interview eye witnesses who were located close to the Pentagon on 9/11. Amongst the eye witnesses they interviewed are two police officers and a Pentagon Helicopter Air Traffic Controller. 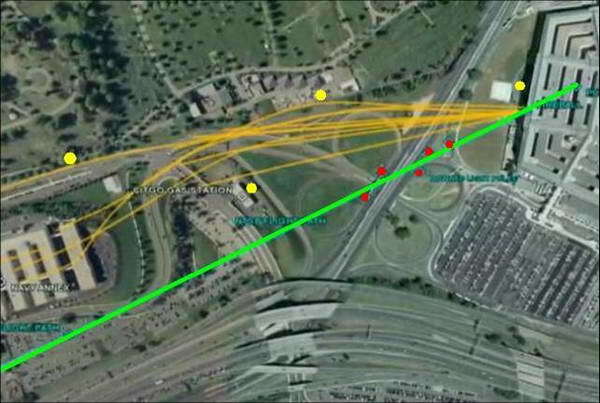 In order to knock down the 5 light poles (red dots) the airplane had to be on the official (green) flight path given by the government which is inconsistent with the eye witnesses. Non of the eye witnesses were able to see the airplane actually hit the Pentagon due to a small hill located between them and Pentagon, some were able to see the explosion. One eye witness located at the other side of the Pentagon saw an airplane at low altitude flying away seconds after he heard the explosion. On their website they provide additional evidence. For example all witnesses are listed in detail. One of the open questions regarding 9/11 is : Why did the US military not react when the 4 airplanes got off their determined flight path and radio communication was lost. 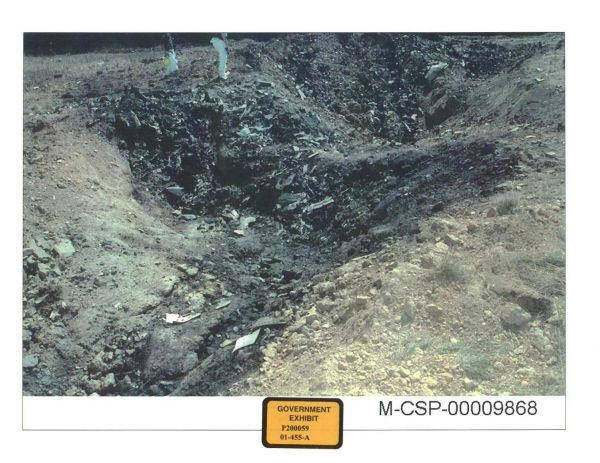 An investigation regarding this matter showed that in the year 2001 alone this process of "air policing" had happen more than 50 times until 9/11 and every single time jet fighters were in the air within minutes and were then directed to where the suspicious airplane was located. At 8:14 flight AA11 ignored a command from air traffic control to change altitude, radio contact was lost and shortly thereafter the transponder was turned off. At 8:25 the air traffic controller reported having heard an announcement probably by a hijacker that was broadcasted on the air instead of on the onboard announcement system. Protocols require air traffic control to inform the military in case of a suspected emergency, this did not happen until 8:40. 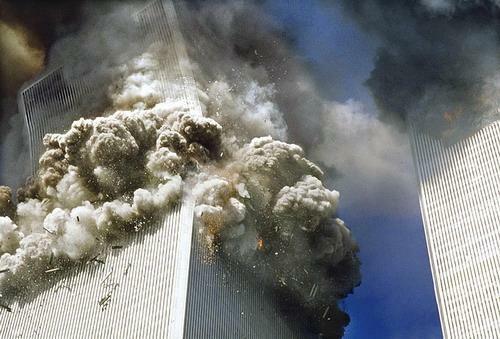 At 8:46 AA11 crashed into the World Trade Center. By 8:53 two fighter jets started but without any orders on where to fly. By 9:01 air traffic control informed the military about flight UA175 heading for New York. By 9:03 UA175 crashed into the World Trade Center. By that time AA77 and UA93 both had been hijacked as well and started to deviate from their course. 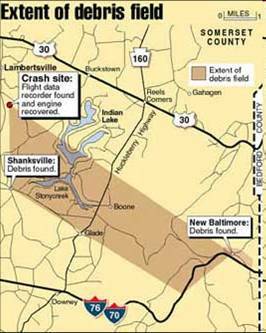 AA77 allegedly crashed in the Pentagon at 9:37, UA93 allegedly crashed in Shanksville at 10:03 The military did not check on both airplanes by fighter jets. How does all this add up to a consistent storyline ? The testimony of Norman Mineta is not mentioned in the 9/11 Commission Report at all, but even worse : The video of his testimony has been removed from the video archive of the 9/11 Commission. If his testimony was not broadcasted on live television, nobody would have even heard about it. The wing of the Pentagon where AA77 allegedly crashed into was the only wing that had been structurally strengthened during a renovation that year. Thus this wing was still almost empty except for parts of the accounting office that just moved in again. On September 10th 2001 Donald Rumsfeld (Secretary of Defense at that time) gave a press conference at the Pentagon where he admitted that 2.3 trillion dollars went missing at the Pentagon. One day later all evidence that would have allowed to track where this money went conveniently disappeared when the accounting office area was destroyed. Suddenly there were more important issues on the radar than fighting corruption. 6. Official aircraft speeds "technically impossible"
An analysis of the radar data from 9/11 showed that United Airlines Flight 175 was flying at 510 knots when it hit the World Trade Center. This speed equals 944 km/h or 586 mph. UA175 was a Boeing 767-200 which has a maximum operating speed at ground level of 360 knots. Commercial airplanes are not designed to fly at high speeds at ground level because the air pressure at ground level compared to travel altitude is so high that the created air resistance could destroy the entire airplane. Pilots for 9/11 Truth is an organization of pilots who have looked into the contradictory evidence for all four airplanes which ranges from too high speed to flight maneuvers which they consider impossible especially if performed by un-experienced pilots. The US government is unwilling to acknowledge the existence of contradictory evidence and is not making any statements on the subject. In the recent years Pilots for 9/11 truth have released several other documentaries all covering different contradictory aspects of the events on that day. You find all of their documentaries in the Resource section. 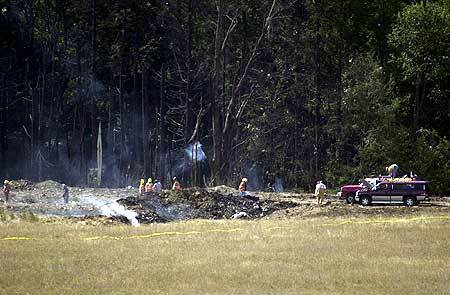 How could the debris be spread this widely if the airplane crashed in one location ? Does this look suspicious to you ? Where is the airplane ?!? In the following video from a news broadcast from September 11th you can see video footage taken from a helicopter of the area surrounding the crash site. There is a lot of miniature debris ("nothing larger than a phone book") spread over an "area of 3-4 miles". 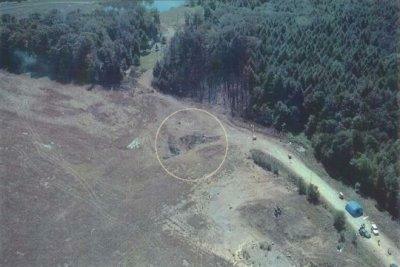 How could this be if the airplane crashed in one location ? It does not mention that if the official “pancake collapse”-theory was true the steel-frame should have remained standing and 110 floors in pancake formation should be found at the bottom after the collapse. Both expectations have turned out untrue. It does not mention that the entire rubble of 9/11 was shipped to China before any proper examination of the evidence could take place. It does not mention that several FBI agents have gone on record claiming that they knew about the plans for 9/11 in advance but their warnings remained unheard. To read the report yourself, just click on the image of it, this will open the PDF version of the report. "A government that conceals the truth puts the nation at risk"
“We to this day don’t know why NORAD [the North American Aerospace Command] told us what they told us, it was just so far from the truth. . . "
In January 2008 Kean wrote an article in the New York Times titled "Stonewalled by the CIA" in which he describes how CIA director George Tenet told the 9/11 Commission point blank that certain areas of research were off limits for them. 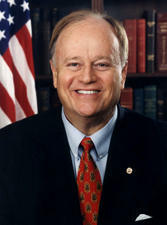 Max Cleland was US Senator for the State of Georgia from 1997 until 2003. He was appointed to serve on the 9/11 Commission but is the only person who resigned from the commission because the Bush administration was stonewalling and blocking the committee's access to key documents and witnesses. 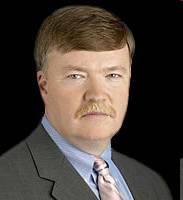 In November 2003 Cleland said "I cannot look any American in the eye, especially family members of victims and say the commission had full access. This investigation is now compromised"
About 3 months after 9/11 Bush gave a speech, during which he says that before he went to the class room at the school event he was "waiting outside" and while waiting he saw "on TV" how an airplane hit the World Trade Center. The problem with this statement is that there was no video footage of the first airplane on TV until September 12th. So which "station" was he watching ? This is a significant observation because if the upper section is supposed to perform the "work" of destroying the building section below itself and it vaporizes half of itself at the beginning of the collapse, then it also lost half of its potential energy.The physical law of conservation of energy says energy can not be created or destroyed, it can only be transformed. In the case of a collapse of a bulding potential energy is transformed into kinetic energy (for the downward acceleration) and somehow the process of destroying the building structure also has to be energized by the potential energy of the building itself. Interestingly enough both towers collapsed practically at free-fall speed which can only happen if all potential energy is transformed into kinetic energy. So where does the energy to destroy the building structure come from ? Even though this tilting occured, the collapse itself was perfectly symetrical as the debris field after the collapse showed. This is rather strange since theoretically the upper section has to perform the "work" of destroying the building below itself and if it starts tilting it should rather tip over the side where it is tilting towards and fall off the side than to continue through the path of greatest resistence. Architects and Engineers for 9/11 have done extensive scientific research into the collapse of WTC 1, 2 and 7. It is highly recommended to visit their website and on it especially the evidence section. Addictionally there are interviews with members of the group as well as a lecture by the founder Richard Gage in the Resources section. Barry Jennings was deputy director of emergency services department. When the first airplane hit WTC1 he immediately headed for WTC7 in which the Office of Emergency Management was located on the 23rd floor. When he arrived, the emergency center was abandoned. Together with a second witness he took the stairway to leave the building. When they were somewhere between the 6th and 8th floor an explosion happened below them and destroyed the entire stairway. 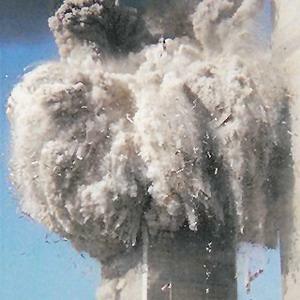 This happened before WTC1 and WTC2 collapsed. Barry was trapped in WTC7 during the collapse of WTC1 and WTC2 and was rescued before WTC7 collapsed. He witnessed multiple explosions in WTC7. He also noticed that - when he was rescued around 1 p.m. - the lobby of WTC7 was completely destroyed and he left WTC7 through a "huge hole in the wall". 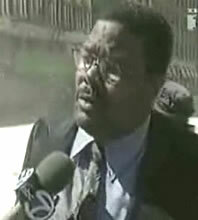 Directly after his rescue Barry was interviewed by ABC7. Barry died in 2008 under mysterious circumstances at age 53. William Rodriguez was a janitor in the World Trade Center’s north tower. He risked his life on 9/11 to help people who could not help themselves by using his masterkey to open locked doors so people could get out of the building. 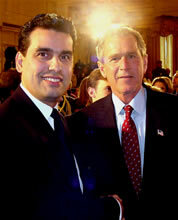 For his heroic behaviour he received praise by many people including George W. Bush. 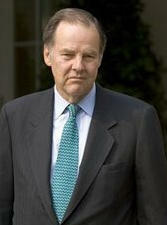 On 9/11 William arrived at work around 8:30 and went into the basement level B1 where his office was. While talking to his supervisor a major explosion happened in the basement level below them. Shortly after this explosion happened he heard the impact of the first airplane hitting the top of the building. You have been presented with 12 different topics regarding 9/11. If you have never researched this kind of information it might be the first time that you heard about any of this. You have to ask yourself, why the mass media has not covered these kind of topics and you have to decide for yourself, what you are going to do next now that you know. The best thing to do might be to first start researching the whole topic for yoursef. You will be amazed how many websites have been created and how much information is available if you're only willing to take a look. The second step might be to tell other people about what you have learned but be aware that the majority of the population does not want to know about any of this and you can not force anybody to face a reality that might shatter their entire world view. 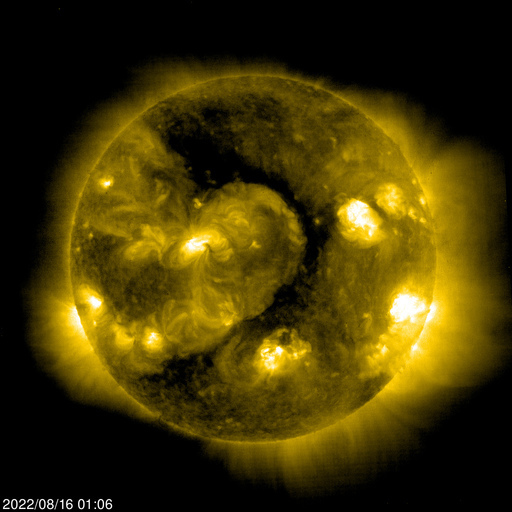 From my personal experience I can only recommend to face the "dark side" of our reality because you can only understand how things add up if you acknowledge the existence of the "dark side" and understand its role in the "big picture". Doing research on these forces and understanding their influence on our lifes ultimately leads to far deeper questions than "What really happened on 9/11 ?"